People are creatures of habit – and that includes when it comes to booking their holidays. With SuperControl, it’s easy to capitalise on this by using our automated email feature to attract repeat bookings from previous guests. Simply set up an email to be sent out 11 months after the last time they booked to tempt them to book again. 1. Log in to your SuperControl account and go to Emails/Letters > Add. 2. Give your letter a name. The name should clearly describe the purpose of the letter. Tell them what’s been happening since their last visit and show them what they’re missing! You don’t need to limit it to things specific to your properties or holiday site – look ahead and tell them what’s going on/coming up locally. Spend some time thinking about what you use here – this is the subject line of the email, and the reason the recipient will either read or delete it. You might have made some changes to your properties/site and want to tempt guests back that way (eg Come back and see us – and check out our new pool) or you might think it’s appropriate to offer an incentive for booking again (eg Enjoy a free spa treatment with your next booking). After that, you can format your email under Word document options. Once you’re happy, click Save. It would be a good idea to set yourself a reminder to go in and edit the message text (and/or Letter name) regularly to keep the content current. Once a month should be enough. You’d do that in Emails/Letters > Edit. 1. 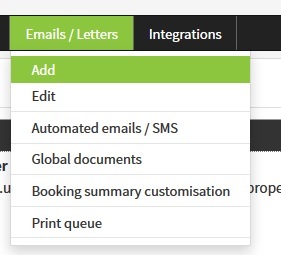 Give your Letter group a name and decide which bookings you’d like it to apply to from the Automatically apply to dropdown menu. 3. Then, select your letter from the dropdown and click Add letter. 5. Below the Settings heading, you’ll see Schedule criteria. This is where you set when the message is generated. In this example, choose Always send from the dropdown (Note: you can add up to four Schedule criteria). 6. Once you’re happy with all the settings, click Update letter at the bottom of the page. By doing all the above, your email will be applied to all bookings 330 days after the booking date (ie it will be sent to guests who booked around 11 months ago). For people with regular holiday habits, that means you’ll be hitting them right at the time they’re researching their next holiday – so, it could be a great way to encourage conversion.